Click the button below to add the American Health - Chewable Papaya Enzyme with Chloropyll - 600 Tablets to your wish list. American Health's famous Chewable Papaya Enzyme With Chlorophyll is the perfect “after meal” supplement to help support and maintain daily digestive health. American Health Chewable Papaya Enzyme With Chlorophyll combines the finest quality of freshly ripened Papaya fruit with papain, amylase and protease enzymes which aid in the digestion of proteins and carbohydrates, while encouraging proper nutrient absorption. American Health Chewable Papaya Enzyme With Chlorophyll formula offers the ideal choice to help with occasional heartburn, gas and other gastrointestinal discomforts. Take this delicious American Health Chewable Papaya Enzyme With Chlorophyll regularly to promote gastrointestinal wellness while helping to reduce bad taste and sweeten breath. Digestion Digestion plays a vital role in our daily health — it's the complex process in which your body transforms the food you eat into absorbable nutrients and energy you need in order to thrive. The way that your food is processed and absorbed contributes to your digestive health. "Digestive health" means a lot more than just an upset stomach. Stress, poor diet, disease and medications are just a few of the things that can disrupt your digestive system's healthy balance. Poor digestion can have the same effects as poor nutrition — it is essential to not only have the right balance of nutrients in your diet, but to also ensure your digestion is performing at an optimum level. A healthy digestive system promotes proper nutrient absorption, intestinal wellness and immune health. When will I start to feel the benefits of a dietary supplement? Due to differences in a person’s metabolism, general health and lifestyle, it is difficult to determine how long it will take for an individual to reap the full benefits of a dietary supplement. It is recommended that you continue to follow the directions as indicated on the label or consult with your health care practitioner. How important is it to take a daily multivitamin? Experts have historically agreed upon the need for every American to consume an adequate amount of vitamins and minerals to help fill the nutritional gaps in his or her diet. Even vegetarians, who some consider to be the archetype of the healthy lifestyle, may need a multi to get the nutrients their diets don’t provide in adequate amounts. In general, our bodies simply cannot obtain all the nutrients we need from the food we eat. According to the Journal of the American Medical Association?, even people who maintain a healthy diet should supplement with vitamins to improve their overall health. Aside from exercise and eating right, a daily multivitamin can help support your immunity, help fight free radical damage, and help your body get the extra support it needs as you age. Look for a whole food concentrate multivitamin, as it supplies your body with naturally occurring nutrients found with fruits, vegetables and whole foods - such as bioflavonoids and antioxidants - in a convenient delivery system. In addition, timed release formulas offer the benefit of both immediate and extended nutritional support throughout the day. What is the best way to stay healthy during the winter months? The goal is to build your immune system and maintain immune wellness. The tried and true remedies are effective: rest, eat healthy foods and drink plenty of fluid. Along with these suggestions include a quality vitamin C supplement such as Ester-C in your diet. Regular intake of Vitamin C is a fundamental way to support immune health, especially with today’s active lifestyles. And, since the immune system is challenged every day – not just during the winter- supplementing daily with Vitamin C helps keep immune system response strong in every season. What is so special about Ester-C Vitamin C? In a single daily serving of 1000 mg, Ester-C delivers advanced active immune system support. It increases vitamin C levels in the body – getting into white blood cells quickly, an important part of your immune system. Ester-C is an easy form of vitamin C to take because it is non-acidic and gentle on the stomach; and it was formulated to be absorbed quickly, maximizing retention and absorption of vitamin C in your body. Ester-C is the only patented brand of Vitamin C available today, and its benefits are documented by years of science and clinical research. I've heard that vitamin C can be tough on the stomach. Is this true? Vitamin C is also known as “ascorbic ACID,” because it is acidic and difficult to take for many individuals with sensitive stomachs. Because Ester-C is non-acidic, it is well-suited for acid-sensitive and non-acid-sensitive individuals. Can I take probiotics if I am lactose intolerant? Yes, many probiotic products are free of lactose. Check the product label for allergen statements, and always check with your healthcare practitioner before beginning a supplementation regimen. Can I take probiotics while taking antibiotics? Probiotic supplements should be discontinued when taking antibiotics. When I look at the Supplement Facts Boxes of probiotic labels, some refer to the strains as “bio-active microorganisms” while others reference “CFU” or “colony forming units”. What do these terms mean? Bio-active microorganisms and “colony forming units” are interchangeable terms to denote the number of probiotic bacteria per serving. Why are there so many different strains in a probiotic supplement? What are their benefits? Different strains of probiotic bacteria are beneficial in different parts of the digestive tract. For example, Lactobaccilli typically colonize in the small intestine while Bifidobacteria will colonize in the large intestine. 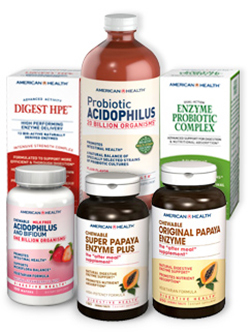 How does acidophilus contribute to digestive health? Acidophilus is a natural form of probiotic bacteria found mainly in the small and large intestines of the digestive tract. Probiotics is a term used to describe the “good” and “healthy” bacteria. Two main types of acidophilus are lactobacilli and bifidobacteria acidophilus, which can be obtained through fermented daily sources as live culture yogurt. However, the potency and bacteria strains vary greatly in yogurts, so if you are looking for a higher count of clinically studied strains, you may want to consider supplementation. Your digestive tract is an important system in maintaining a healthy lifestyle through healthy digestion. It is important to supplement because, as we age, the composition of intestinal microflora can be altered due to antibiotics, poor eating habits, stress and certain health conditions that result in occasional diarrhea. By maintaining a proper balance of intestinal microflora, we are able to increase the acidic environment of the intestines, which allows our bodies to maintain healthy bacteria. It will also support proper digestion, healthy immune function- (70% of immune cells are located in the gastrointestinal tract) - and allows us to properly absorb nutrients from the foods we eat. What exactly is digestive health? It is more than just an upset stomach and regularity. Research now suggests digestive health is a key contributor to immune health. Digestion is a complex process of transforming the food we eat into energy while ridding our system of waste and toxins. Not only is the gut important to digestion, but it is critical to the overall performance of the immune system. Here the gut is able to recognize and reject microorganisms that may challenge the body’s defense system. Research suggests that probiotics help to support the barrier in the intestines which aid in the protection against harmful agents. We all have both good and bad bacteria in our systems. We need the good bacteria in our digestive tract to help keep the bad bacteria in check. Probiotics have been shown to stimulate the growth of good bacteria in the intestinal tracts, help replenish depleted good bacteria after taking antibiotics, encourage proper nutrient absorption and promote immune health. What could effect the balance of digestive health? Ideally, the digestive tract should contain a balanced ratio of good bacteria and bad bacteria. Stress, poor diet, disease and even medications are just a few of the things that can disrupt digestion and its healthy balance of bacteria in our system. Probiotics add back the good bacteria which helps maintain this natural balance of organisms (microflora) in the intestines. Part of the decline of the good bacteria is due to increased usage of higher and stronger antibiotics. Many of us have been told by healthcare professionals to eat yogurt because antibiotics kill both the good and bad bacteria. Good bacteria have now become casualties in our mission to provide a cleaner and healthy world. Recently, with the introduction of “antibacterial products,” we have been on a mission to rid our environment from disease and all bacteria. In combination with food safety regulations, increased additives in our foods and heat processes used to extend shelf life, neither the bad nor good bacteria are surviving the manufacturing process. To restore a level of digestive wellness, we need to put the good bacteria back into our systems. What role do Enzymes play in digestive health? Enzymes are biochemical catalysts that convert food into nutrients your body can absorb, and making these nutrients available for the body’s energy needs, cell growth and other vital functions. There are many different types of digestive enzymes with specific roles - amylases are responsible for breaking down carbohydrates into simple sugars, lipases breakdown fats into fatty acids, and proteases break down proteins into amino acids – together they promote complete and proper digestive balance. Enzymes are produced naturally by the body during the digestive process; however we all do not produce enzymes at the same levels – some more some less. In fact studies suggest our bodies decrease enzyme production overtime. While enzymes are produced mainly in our digestive system they can also be found in some whole foods like papaya, which is a rich source of the enzyme papain, a powerful protein-dissolving natural enzyme. Enzymes promote nutrient absorption, natural regularity, immune health and gastric wellness. Supplementing with a quality enzyme formula is a basic approach to supporting proper digestive wellness.